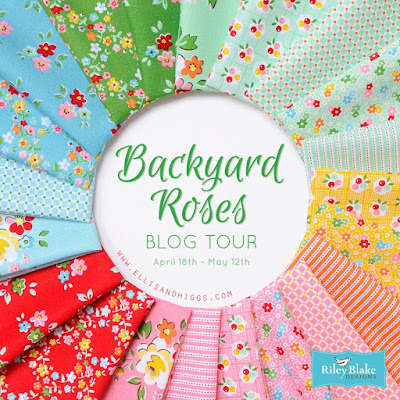 Hi everyone and welcome to my stop on the Backyard Roses blog tour. 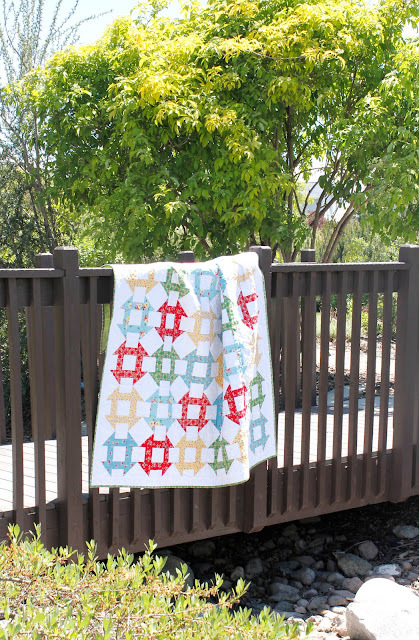 Backyard Roses is the newest fabric line designed by Nadra Ridgeway (www.ellisandhiggs.com) for Riley Blake. It's a charming line, filled with happy colors and sweet flowers. I've had a classic churn dash quilt on my wish-list for a couple of years now and when I saw Backyard Roses I KNEW it would be perfect! 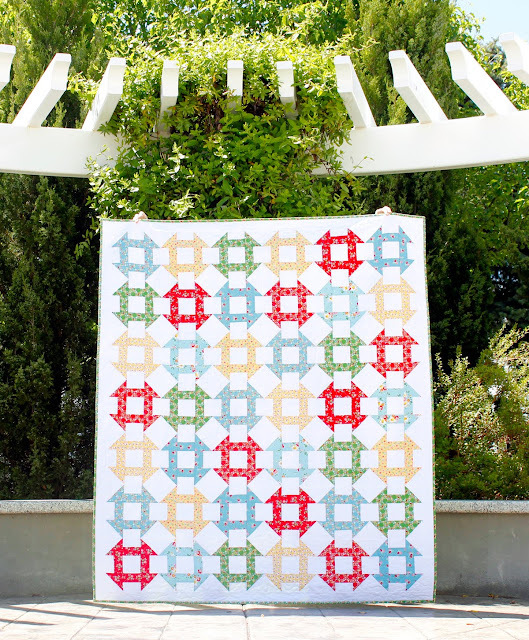 The small scale florals really shine when used in small blocks like this. I selected just a few of the colors from the range. Can't go wrong with the primary colors, right? Well, primary colors + green ;) The line also includes a pretty pink and a fresh mint color. 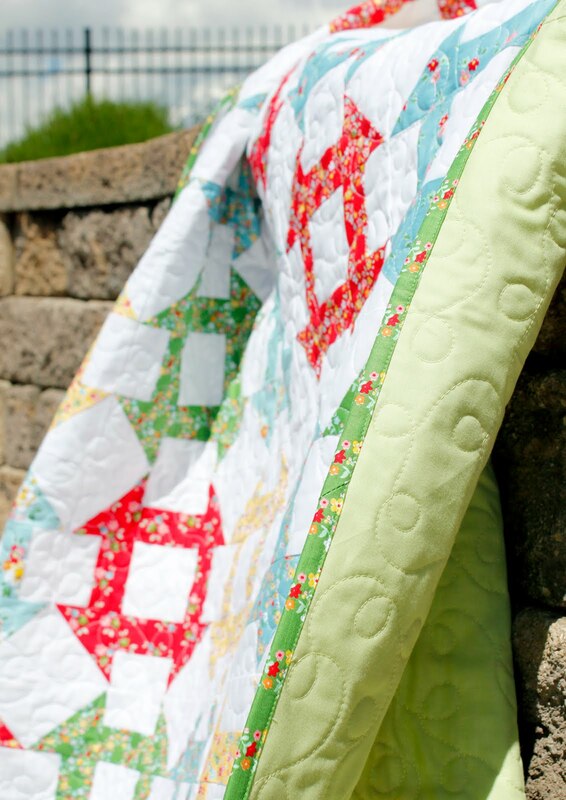 I quilted it with some medium sized loops, and I backed the quilt in a solid green. I used my most favorite green print from the line as the binding. I can't get enough of that green! The finished quilt measures 59" x 68"
Here are the links to the other stops on the tour. Click on the links to see the other projects. You can find Backyard Roses in stores now - here at the Fat Quarter Shop, here on Westwood Acres, and here at Pink Castle Fabrics. Thank you Andy, for the free pattern. This is a block I need to practice on. Your quilt with this fabric is so pretty. Love it! Love it! 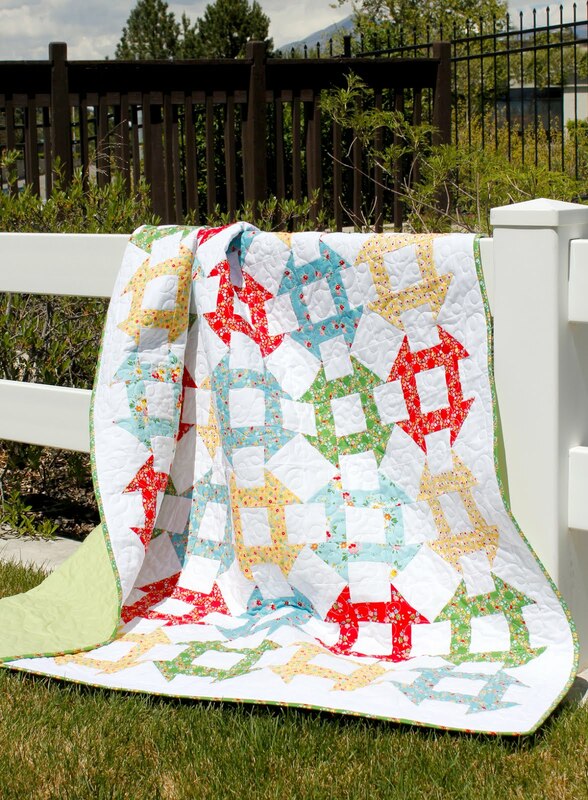 A beautiful spring quilt! Love your bright and cheery quilt! Thank you for the free pattern. Greatly appreciated! So stunning.Thanks for the pattern. HELLO,so pretty! Beautiful fabrics! Thanks for sharing! Beautiful! 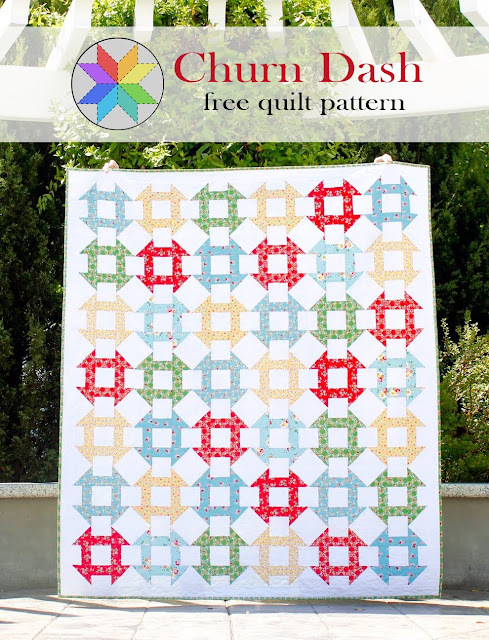 A churn dash quilt has been on my to-do list for too long so maybe this will inspire me to make my own. I love all your work and this is no exception! Fresh is the first word that came to mind when I saw it! Great! choice on the Churn Dash with these beautiful fabrics! Thank you for the wonderful pattern,my only hope is I can make one as beautiful as yours! I couldn't save the file. Hi there - could you view or print it? I just did a test download and it worked fine for me -but let me know and I can help fix the problem!